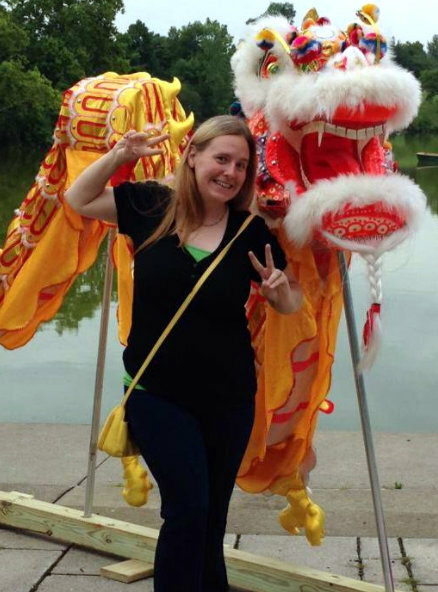 My Blissful Journey: Weekend Round-Up & Raw Vegan Giveaway! Weekend Round-Up & Raw Vegan Giveaway! This past weekend it was my intention to start my weekend giveaways here but something went wrong so I will start them today instead. But before we get to the prize at stake I thought I would tell you a little bit about this past weekend! First up...one of the smoothies I forgot to post last week! It was delicious! It had Blackberries, Blueberries, Strawberries, Raspberries, Coconut Water, and Garden of Life Vanilla Organic Plant Protein. I just LOVE the color of this...don't you? No...this isn't a vegan ice cream...it's Balsamic Beet Hummus! I made some over the weekend because I enjoyed the Beet Hummus I bought the weekend before from Trader Joe's! In this there is...1 C Small Beets, 1 C Chickpeas, 1/3 T Tahini, 2 T Lemon Juice, 1 T Garlic Grapeseed Oil, 1 to 2 T Balsamic Vinegar. Sunday I cleaned some of the kitchen and frig. I concentrated on the stove and used one of the new products I got from Norwex and it worked really well. I did 2 loads of dishes and dried some laundry. I cleaned the dogs pens out and did some of their blankets. 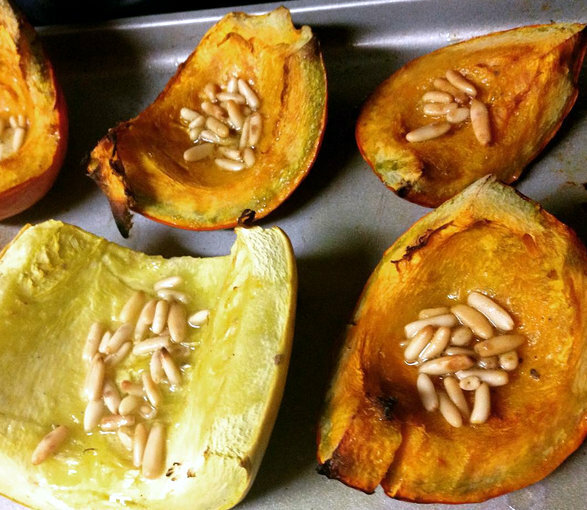 I finally had time to roast some squash I had. There were types the Kabocha Squash AND Spaghetti Squash. I roasted them with Garlic Grapeseed Oil and 2 different kinds of pine nuts (standard and long). I then took the Spaghetti Squash and used it in the base for the dish you will see in just a little bit and I cubed up the Kabocha Squash and used it as well. I sampled a bit of each and they were tasty! Below is the finished product. 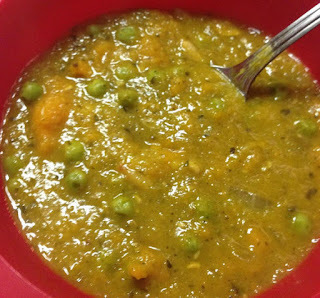 It's a Thai Curry Squash with peas and pine nuts. I ate a bowl as a soup and it was totally YUMMY. Since I made a HUGE batch I decided to cook up some lentils and rice so I could pair it for meals this week. For the base recipe I used...1 small spaghetti squash, 1 small kabocha squash, 1 T grapeseed oil and about 1/4 C Pine nuts - I roasted those ingredients at 380 degrees for about a half hour. I then took 1 sweet onion and cooked it down then added half the pine nuts that were roasted and about 6 basil leaves that were dried and crumbled. Added 1 can of coconut milk, I added the spaghetti squash to it and simmered for a few then put in my blender to make a base. I then added 4 T Wildtree Green Curry Paste/Sauce, the other half of the roasted pine nuts, 1 C Peas, and Black Sea Salt to taste. It turned out great! Saturday we sold our Wildtree products at a regional winery. I'm thrilled because this winery doesn't use purifiers, clarifiers, or preservatives in their wine that tend to be fish or gelatin based! Next to the door they had this crazy looking guy and they were all decked out for Halloween. It made all sorts of weird noises and moved. They had him on an operating table and it was fun to watch the people come in and freak out when the sensor went off! It was a very windy day and driving home was a bit challenging at times because of the wicked wind! Saturday night the dogs enjoyed snuggle time on the sofa. Paco liked that I let him use my pillow, too. He's doing well but his legs still have good days and bad days. He's a trooper, tho, because he still trucks around the house in his own special way. And of course he's still as cute as ever. Sunday night the dogs seemed to enjoy family time, too! We caught up on Grey's Anatomy and Reign which are two of the shows we enjoy during the week on Hulu. Okay! It's time! It's time for the giveaway I intended for this past weekend! All you have to do is be a US Resident and comment on this post with your email addy. Garden of Life is letting me give away a TUB of their Chocolate Raw Meal! It's vegan and RAW! New packaging and everything! Woot! I will choose a winner sometime tomorrow and announce the winner on Wednesday! Each weekend I will have a different giveaway, too, so stay tuned! 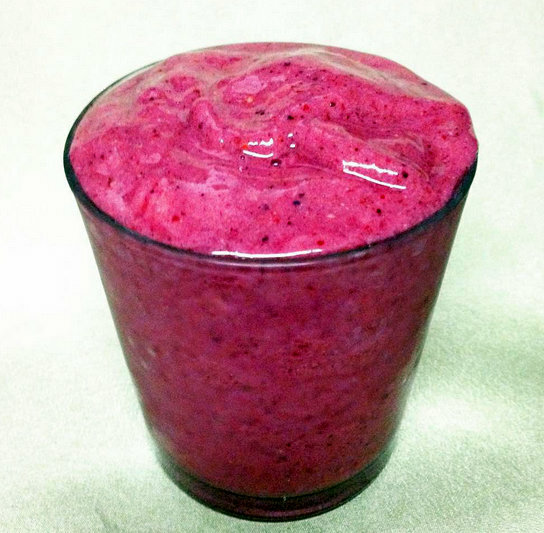 I love the color of the smoothie! I always love the bright reds and pinks in foods! I love seeing Paco's sweet face! I really liked the color on that one, too! 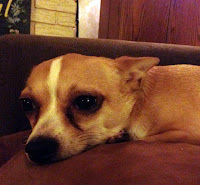 Paco's so sweet - I wish he didn't have his issues but he's such a strong soul! He's a trooper that is for sure! All are welcome here! 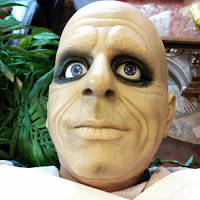 Thanks for visiting, reading, and commenting! Thanks so much for the feedback on the hummus and Thai inspired dish, too! Yes...I used the Kabocha Squash - cubed and the spaghetti squash I blended for the base so there are actually 2 types of squash in there! That smoothie is gorgeous! Ours looked similar this morning from a chunk of raw beet I threw in, so fun! And thank you for the giveaway opportunity, no know I am a huge GoL fan! And I need to find that hummus at TJ's! Thanks! Can't wait to see your smoothie! How far is TJ's from you? Thanks so much! I had it for dinner with Lentils and Wild Rice. Today I think I will have the rest for lunch. That's a neat idea for kids - I didn't even think about that! I'm not a fan of salty things that is for sure! I wouldn't know if I would be amused or horrified to see that guy at Halloween. LOL!!! I love the color of the smoothie and the hummus! I love beets. I juice them regularly and have used them in a variety of ferments that I make. I'm trying to incorporate more and more of them! I made some of this hummus for my mom. She LOVES beets but my dad isn't a fan. My dad loves hummus but my mom as hot and cold on it. I figured if I made a flavor she really liked she might like hummus more. She tried it and liked it! YAY! Beet hummus is so good! If you're ever in the DC area definitely try Soupergirl's beet hummus. It's a lovely bright purple, even more colorful than TJ's, and everything they sell is vegan! I will have to google Soupergirl sounds awesome! Thanks for letting me know about it! The smoothie looks great and sounds delicious. ♥ My sister from Canada is visiting and we were just talking about beet hummus, I hadn't seen it here in the US.....so pretty! Yum that beet hummus looks and sounds delicious! As does your smoothie! I cant believe how much that Hummus looks like Ice Cream. Paco is so adorable. You are so lucky. 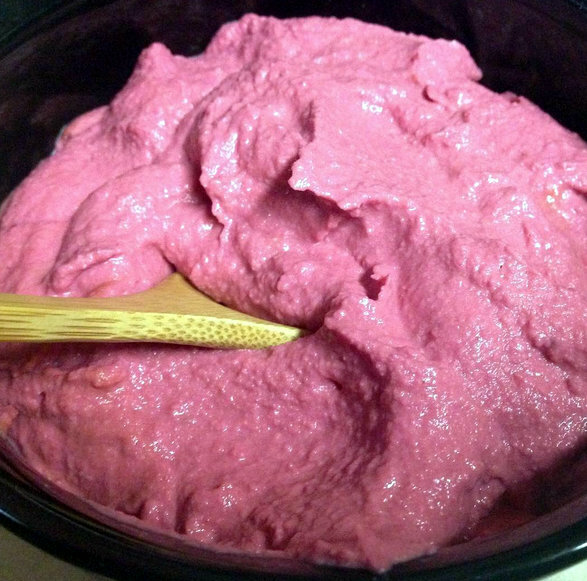 I have been thinking about doing a Cashew Ice Cream and using some Beet Liquid for the coloring! What do you think!?! Love the halloween decorations! Must have been so fun being set up next to them. I've been craving more of the beet hummus actually! LOL Might have to make more this weekend! Due to the high antioxidant benefits of berries I try to consume some type of organic berrry in season each day. 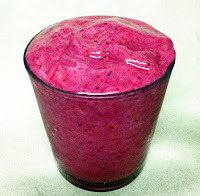 Fortunately, I am able to find frozen organic berries at my local natural foods store and they are great for smoothies. Thanks for sharing with us at the Healthy Happy Green and Natural Party Blog Hop. I appreciate it! I'm pinning and sharing.